Michael Gregson is Chairman, President and Founder of the Life Science & Technology HUB. The LST HUB was formed to unite the resources needed to grow the South Florida life science and technology business ecosystem. Michael began his career as an engineer at Bell Laboratories and has worked in various engineering, marketing, and management positions for such major corporations such as ATT, Siemens, Fujitsu, Racal, Applied Digital Access(ADA), and SimpleTech. While at these companies, his leading edge designs solved problems years ahead of their time. 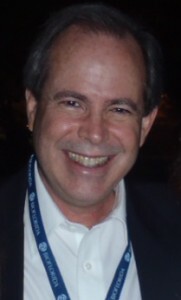 He has the distinction of being the first person to place a digital voice phone call over software that he created (Bell Labs 1989), the first graphical user interface for generic router network management tools (Racal 1993), and created the first browser based network embedded protocol analyzer (ADA 1997). The network embedded protocol analyzer was the first Internet based product used in the telephone switching offices. While at Applied Digital Access he built a business unit with offices throughout the country and in Canada based on this product line. In the mid-2000s he turned his attention to the Life Sciences with the goal of merging technology with science to make the process of discovering, researching, and developing health products quicker and more efficient. His company WaveFront Health Technologies is developing CorrStat – the first Interactive Health Information Network. He holds a Computer Science Degree from North Central College. Denise Garcia is LST HUB’s Executive Director and co-founder. Her desire to meet others in the life science and technology industries motivated her to organize LST HUB in part by drawing on her life science experiences in San Diego. Denise began her life science career in San Diego during the mid-1980’s and was part of the exciting “Biotech Beach” growth era. She has over 27 years of experience in the biotech, pharmaceutical and medical device industries. Her first position was at Hybritech Inc. Hybritech was known for their “monoclonal antibodies or silver bullets”. She started as a field correction specialist processing requests from all over the world which led to positions in manufacturing operations and in Regulatory. She has worked for Hybritech, Eli Lilly, Beckman Coulter, IDEC Pharmaceuticals and Biogen. Denise joined WaveFront Clinical Management Services in 2005 as the Director, Clinical Records Solutions. The goal was to help companies become more efficient by moving their essential clinical files to an electronic format. She managed teams in San Diego and Boston. Her focus today is on helping the South Florida’s Life Science and Technology community grow. She currently works at Ionis Pharmaceuticals in Clinical Operations.